Microbial keratitis (MK) is an important cause of ocular morbidity (1-3). Ocular surface disease and previous ocular surgery have long been identified as major risk factors for development of this sight-threatening disorder (1,2). The introduction of daily wear soft contact lenses (DWSCLs) as a modality for the cosmetic treatment of refractive errors in the 1970s and extended wear soft contact lenses (EWSCLs) for therapeutic management of ocular surface disease in the 1980s increased the relative contribution of contact lens wear as a risk factor for cases of MK. The adoption and increasingly popular overnight use (or misuse) of EWSCLs as a convenient method for correction of routine refractive errors has been associated with a dramatic increase in cases of MK in eyes that are not otherwise predisposed to this condition (2-9). By 1989, the annualized incidence of MK was estimated to be 20.9 cases per 10,000 persons using EWSCLs for cosmetic purposes compared with 4.1 cases per 10,000 persons using DWSCLs (4). The relative risk of soft contact lens (SCL)-related MK is incrementally related to the extent of overnight wear and may be increased by as much as 15-fold when compared with daily use of the same lens (5). With DWSCLs, even as little as one night per week of overnight use has been shown to be associated with a 6.5- to 9.0-fold increased risk for development of MK (5,6). Silicone hydrogel contact lenses were introduced in the hope that they would be associated with a lower risk of MK than EWSCLs; however, this hope has not been realized (7,8), with an estimated annualized risk of 25.4 cases per 10,000 persons with hydrogel contact lenses compared with 19.5 cases per 10,000 persons with EWSCLs (8). Although a variety of bacterial and fungal pathogens may cause SCL-related MK, most cases are caused by Pseudomonas aeruginosa (9). Bacterial keratitis caused by this Gram-negative organism is more fulminant and associated with a worse visual prognosis than that caused by most other common bacterial pathogens (1-3,7-9). Subjectively, the patient reports the sudden onset and rapid progression of ocular pain, redness, tearing, photophobia, and blurred vision. On examination, the quintessential clinical features are a corneal epithelial defect and a stromal infiltrate, which often assumes a “ring” configuration (Figure 1). The infiltrate may be associated with stromal necrosis and progressive thinning and/or perforation. There is often a characteristic, albeit not pathognomonic, “ground glass” appearance to the noninvolved areas of the cornea adjacent to the active microbial process, as well as an inflammatory endothelial plaque and/or hypopyon. Figure 1. Pseudomonas keratitis. There is a large epithelial defect associated with a ring-like stromal infiltrate, which is “soupy” in appearance owing to stromal necrosis. The noninvolved areas of the cornea have a characteristic “ground glass” appearance. A small hypopyon is present. 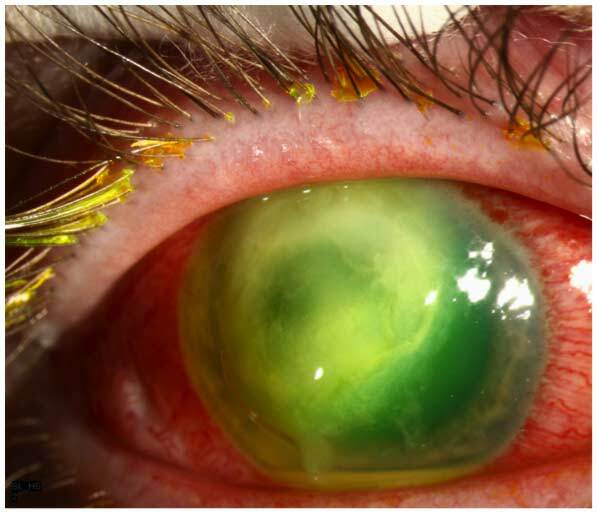 Pseudomonas keratitis is treated with intensive topical antibiotic therapy with fluoroquinolones or fortified Gram-negative antibiotics, including aminoglycosides (e.g., tobramycin), cephalosporins (e.g., ceftazidime), and synthetic penicillins (e.g., carbenicillin). The microbiological response is usually rapid, with stabilization of the growth of stromal infiltrate and arrest of further stromal necrosis and thinning within 24 to 48 hours. Although controversial, many practitioners (including our group) cautiously introduce topical corticosteroids after a positive antimicrobial response has been documented in an effort to reduce morbidity associated with uncontrolled inflammation and to decrease permanent stromal scarring (2,3). At least one retrospective study has demonstrated the efficacy of topical steroids in shortening the clinical course and reducing visual loss (2), whereas one prospective study has not demonstrated a statistically favorable response (3). No adverse steroid complications occurred in either study (2,3). Therapeutic keratoplasty, which is rarely performed, is usually required only in eyes presenting with advanced stromal necrosis and thinning with a large descemetocele and/or frank perforation. Pseudomonas-related MK can be associated with permanent central corneal scarring and/or irregular astigmatism and visual loss despite optimal management and prompt eradication of the microbial infection (1-3,7-9). Factors associated with a poor visual prognosis include older patient age, deep stromal involvement, and prior topical steroid use. When visual rehabilitation is required due to stromal scarring, penetrating keratoplasty or deep anterior lamellar keratoplasty are the procedures of choice. Impaired vision caused by superficial corneal scarring can be improved with phototherapeutic keratectomy (PTK). Astigmatism attributed to post-infectious or post-PTK irregularities within the visual axis can be managed with a rigid gas-permeable hard contact lens. Since the majority of cases of MK in contact lens wearers are due to Pseudomonas, and this specific infection heralds a worse prognosis, we decided to investigate outcomes at our facility. The purpose of the present study was to determine the frequency and extent of visual loss in cases of Pseudomonas keratitis occurring in eyes with previously normal visual acuity and no risk factors for MK except contact lens wear. After approval was obtained from the Institutional Review Board, a retrospective study was conducted on the medical records of patients who had received a microbiologically confirmed diagnosis of Pseudomonas keratitis at the University of Iowa Hospitals and Clinics (UIHC) from July 1, 2006, to June 30, 2011. Eyes were included in the statistical analysis if the following criteria were met: a history of contact lens use at the time of onset of the corneal infection, involvement of the central 6 mm of the cornea at the time of presentation, and more than 6 months of follow-up. Eyes were excluded from the statistical analysis if the pre-infectious best corrected visual acuity (BCVA) was less than 20/20 and if there was a previous history of anterior segment surgery, treatment for ocular surface disorders, or use of any topical ocular medications. The main outcome measure was final visual outcome, as measured at the most recent follow-up visit and after all surgical interventions. Mild visual loss was defined as a final BCVA that was between 20/25 and 20/40; moderate visual loss was defined as a final BCVA between 20/50 and 20/200; and severe visual loss was defined as a final BCVA that was worse than 20/200. Data were extracted from each chart and analyzed on a Microsoft Excel 2008 for Mac, version 12.3.2 spreadsheet (Microsoft, Redmond, WA). The Fisher exact test was used for comparison of categorical variables. A comparative analysis of differences in visual acuity outcomes was performed by converting Snellen visual acuity measurements to logMAR values. Statistical comparisons were made with Statistical Product and Service Solutions (SPSS) 170 software (SPSS, Chicago, IL). A Pvalue less than or equal to 0.05 was considered statistically significant. A total of 29 eyes (28 patients) were treated in the Department of Ophthalmology at UIHC for Pseudomonas keratitis from July 1, 2006, to June 30, 2011. Among these, 8 eyes (8 patients) met the inclusion criteria. This included 6 men and 2 women, with a mean age of 35.5 years (range, 19-69 years). At the time of presentation, all 8 patients (100.0%) were using EWSCLs, with either occasional or regular overnight wear. At initial presentation, the median visual acuity was hand motion (range, 20/60 to light perception). Only 1 eye (12.5%) had a Snellen acuity that was better than 20/200. The mean maximum diameter of the stromal infiltrate was 4.0 mm (range, 1.5-6.0 mm). The mean minimum was 3.6 mm (range, 1.5-5.5 mm). The initial depth was estimated to be less than 50% in 4 eyes (50.0%) and greater than 90% in 2 eyes (25.0%). A hypopyon was present in 6 eyes (75.0%). Treatment with two Gram-negative antibiotics was administered to 7 eyes (87.5%), and monotherapy was administered to 1 eye (12.5%). The Gram-negative antibiotics that were used included fluoroquinolones (7 eyes), fortified tobramycin (7 eyes), and fortified ceftazidime (2 eyes). Topical corticosteroids were introduced in the first postoperative month in 7 eyes (87.5%), including 4 eyes in which they were initiated during the first week (between days 3 and 7). Topical steroid use was not associated with any cases of progressive thinning and/or perforation or increase in intraocular pressure. No eyes required a therapeutic keratoplasty to achieve microbiological resolution. An optical penetrating keratoplasty was performed in 3 eyes with post-infectious scarring after a mean interval of 8.6 months (range, 4.8-13.5 months) from initial presentation. Simultaneous phacoemulsification with posterior chamber intraocular lens (IOL) implantation was performed in 2 eyes. All 8 eyes (100.0%) achieved resolution of MK with medical therapy (Figure 2). After a mean follow-up of 8.7 months (range, 6.0-13.5 months), the median BCVA was 20/50 (range, 20/20 to hand motions) (Figure 2). Three eyes (37.5%) experienced severe vision loss (defined as worse than 20/200) prior to undergoing rehabilitative surgical intervention. No statistically significant correlation was detected between initial size or depth of the infiltrate, presence or absence of hypopyon, and timing of initiation of topical steroid therapy and the visual outcome after completion of medical therapy. Figure 2. Visual outcomes vs initial therapeutic intervention for contact lens-related Pseudomonas keratitis and subsequent surgical interventions. The 3 eyes with severe visual loss were treated with an optical penetrating keratoplasty. After a mean follow-up period of 43.2 months (range, 30.0-59.2 months), the grafts remained clear, with a final BCVA of 20/20 in 2 eyes and 20/30 in 1 eye. The 4 eyes with mild or moderate visual loss did not undergo further surgical rehabilitation. Including the surgical interventions, the final median BCVA was 20/25 (range, 20/20 to 20/50). Five eyes (62.5%) experienced mild (n = 3; BCVA = 20/25, 20/25, 20/30) or moderate (n = 2; BCVA = 20/50, 20/50) visual loss. No statistically significant correlation was detected between initial size or depth of the infiltrate, presence or absence of hypopyon, and timing of initiation of topical steroid therapy and the visual outcome after completion of all therapeutic interventions. The annualized incidence of approximately 2 cases of MK per 1000 overnight SCL wearers has resulted in an unacceptably large number of cases of MK and visual loss caused by this widespread practice. In the current study, 8 SCL wearers with previous excellent vision and no other risk factors for development of MK were treated for acute central corneal pseudomonas infections. All 8 patients were EWSCL wearers who wore their lenses overnight either occasionally or regularly. There were no instances of pseudomonas keratitis in either patients who did not wear contact lenses or among DWSCL for the five years that were retrospectively analyzed. Fortunately, all 8 patients were successfully managed with medical therapy alone without the need for acute therapeutic keratoplasty. However, after resolution of the microbial infection, 7 eyes (87.5%) had experienced loss of BCVA. Of these 7 eyes, 3 eyes had a BCVA of less than 20/200. Subsequently, these 3 eyes underwent PKP for visual rehabilitation with fortuitously excellent outcomes, albeit with a lifelong risk of graft failure. Surgical intervention was not offered or requested for the 2 eyes with moderate loss of BCVA to 20/50 (a level of function that would preclude the opportunity to obtain or retain a commercial driver’s license) or the 2 eyes with a BCVA of less than 20/20 but still better than 20/40 (a level of function incompatible with obtaining a pilot’s license). Overall, the visual outcomes represented a dramatic improvement compared to initial presentation; however, much of the morbidity of the infection could likely have been prevented by avoiding EWSCL use. In an era in which the rarest of complications attributed to pharmaceutical compounds, medical devices, or surgical procedures becomes the topic of public outrage, media coverage, and legal exploitation, it is surprising that the epidemic of sight-threatening cases of MK associated with overnight contact lens use has not resulted in more restrictive Food and Drug Administration (FDA) safety recommendations and warnings, extensive coverage about the latest "health risk in our midst" on popular television talk shows and supermarket tabloids, or a flurry of late-night advertisements and infomercials inviting "victims" to come forth for "compensation they deserve" through large class-action suits that are being pursued on their behalf by allegedly well-intentioned and public safety-minded attorneys. Schein and collaborators (4,5) have estimated that 49% to 74% of contact lens-related MK could be prevented by simply eliminating overnight SCL wear—a finding that should have, but has not, resulted in stricter guidelines and recommendations regarding this practice. It remains the responsibility of eye care practitioners to provide their patients who choose contact lenses as an alternative to spectacle wear with appropriate guidance to reduce the unnecessary risk of MK. Patients who seek alternatives to spectacle wear for cosmetic, recreational, or occupational purposes, but are not insistent on uninterrupted 24/7 neutralization of their refractive error, should be guided toward safer alternatives, such as rigid gas permeable hard contact lenses or DWSCLs (preferably daily disposables, if the refractive error permits). Ideally, contact lenses for overnight use should be prescribed reluctantly (or not at all), unless there are specific medical (e.g., arthritis) or functional (e.g., assignment to a combat zone) needs that justify the risk. At a minimum, the elective prescription of contact lenses for overnight use should be undertaken only after appropriate informed consent has been obtained and alternative permanent solutions, such as refractive surgical intervention, have been discussed. Otri AM, Fares U, Al-Aqaba MA, et al. Profile of sight-threatening infectious keratitis: a prospective study. Acta Ophthalmol 2012; Aug 3. doi: 10.1111/j.1755-3768.2012.02489.x. (Epub ahead of print). Al-Shehri A, Jastaneiah S, Wagoner MD. Changing trends in the clinical course and outcome of bacterial keratitis at King Khaled Eye Specialist Hospital. Int Ophthalmol 2009;29:143-152. Sy A, Srinivasan M, Mascarenhas J, et al. Pseudomonas aeruginosa keratitis: outcomes and response to corticosteroid treatment. Invest Ophthalmol Vis Sci 2012;53:267-272. Schein OD, Glynn RJ, Poggio EC, et al., and the Microbial Keratitis Study Group. The relative risk of ulcerative keratitis among users of daily-wear and extended-wear soft contact lenses. A case-control study. N Eng J Med 1989;321:773-778. Poggio EC, Glynn RJ, Schein OD, et al. The incidence of ulcerative keratitis among users of daily-wear and extended-wear soft contact lenses. N Engl J Med 1989;321:779-783. Stapleton F, Edwards K, Keay L, et al. Risk factors for moderate and severe microbial keratitis in daily wear contact lens users. Ophthalmology 2012;119:1516-1521. Schein OD, McNally JJ, Katz J, et al. The incidence of microbial keratitis among wearers of a 30-day silicone hydrogel extended-wear contact lens. Ophthalmology 2005;112:2172-2179. Stapleton F, Keay L, Edwards K, et al. The incidence of contact lens-related microbial keratitis in Australia. Ophthalmology 2008;115:1655-1662. Keay L, Stapleton F, Schein O. Epidemiology of contact lens-related inflammation and microbial keratitis: a 20-year perspective. Eye Contact Lens 2007;33:346-353.